Divčibare (Serbian Cyrillic: Дивчибаре, pronounced [dǐʋtʃibarɛ]) is a town and mountain resort situated on the mountain Maljen (1104 m) in western Serbia, south-east of Valjevo, at the altitude of 980 metres above sea level. The permanent population of the town is 141 people (2011 census), although it varies significantly due to the flux of tourists and weekend house owners. Divčibare is a highland, surrounded by several peaks and saddles, covered with snow for three to four months each year. In other seasons, the micro-climate is rather pleasant, with 280 annual sunny days. The climate is attributed to fresh and dry winds coming from the Mediterranean. All this, and fact it is just 115 km (71.46 mi) away from Belgrade makes Divčibare attractive in summer and winter alike and one of the most popular resorts in Serbia. There are two expert ski tracks (850 and 650 m), and several novice tracks. Divčibare is accessible via well-maintained roads from the north (Valjevo), west (Mionica), and south (Požega). It has hosted several Serbia Rally (and formerly YU rally) competitions. Excursions to Valjevo and attractions in its vicinity include the Petnica Sports and Recreational Centre with four swimming pools and thermal mineral water, Petnica Cave, the Church of the Holy Mother's Assumption, the village of Brankovina, and Pustinja Monastery. Vrujci Spa is a town in the northwestern part of Serbia, at the northern base of the Suvobor mountain and in the valley of the River Toplica. The second biggest waterfall in Serbia, Skakalo (20m) on Manastirica river is located nearby. ^ "2011 Census of Population, Households and Dwellings in the Republic of Serbia: Comparative Overview of the Number of Population in 1948, 1953, 1961, 1971, 1981, 1991, 2002 and 2011, Data by settlements" (PDF). Statistical Office of Republic Of Serbia, Belgrade. 2014. p. 57. ISBN 978-86-6161-109-4. Retrieved 2014-06-27. Wikimedia Commons has media related to Divčibare. 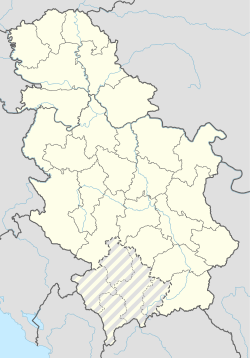 This Kolubara District, Serbia location article is a stub. You can help Wikipedia by expanding it. This page was last edited on 10 December 2018, at 23:31 (UTC).